What does the Construction and Demolition Ordinance require? By law, C&D debris material removed from a project must be recycled or reused. No C&D debris can be taken to landfill or put in the garbage. San Francisco Ordinance No.27-06 took effect on July 1, 2006. It enacted a new Chapter of the Environment Code (Chapter 14) and made amendments to the Building Code, the Health Code and the Police Code in order to establish a comprehensive program to effectuate the City’s goals. View Ordinance No. 27-06 (PDF). 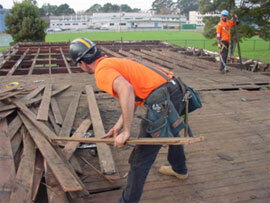 This ordinance affects all construction and demolition (C&D) projects in San Francisco. What are the penalties if someone doesn’t comply with the ordinance? Any person or company found in noncompliance with the ordinance may incur substantial civil and/or criminal penalties, including fines and suspension of their registration. What is Construction and Demolition (C&D) debris material? C&D debris includes building materials and solid waste generated from construction and demolition activities including, but not limited to, asphalt, concrete, brick, rock, soil, lumber, gypsum wallboard, cardboard and other associated packaging, roofing material, ceramic tile, carpeting, fixtures, plastic pipe, metals, tree stumps, and other vegetative matter resulting from land clearing. It does not include food waste, hazardous materials or refuse. How should C&D debris material be handled? C&D debris material separated by type at the job site (source-separated) for reuse or recycling (such as metal, wood, drywall, cardboard, concrete, etc.) must be taken to a facility that reuses or recycles those materials. The ordinance requires that all mixed C&D debris is transported off-site by a Registered Transporter and taken to a Registered Facility that processes all loads containing mixed C&D debris for recycling. Click here for lists of Registered Transporters and Registered Facilities. Haulers whose vehicles have no more than two axles and no more than two tires per axle. all mixed C&D debris is taken to a Registered Facility. What’s involved in becoming a Registered Transporter? A Registered Transporter Application is completed and submitted to the Department of the Environment for review. The applicant must agree to comply with all aspects of registration and the C&D ordinance. There is no charge for registration, and it must be renewed every two years. How do I find a Registered Transporter or Facility? Click here for a list of Registered Transporters and Registered Facilities. Are there special requirements for full demolition of existing structures? Yes. Full demolition of an existing structure requires that a Demolition Debris Recovery Plan (DDRP) be submitted to and approved by the Department of the Environment before a Full Demolition Permit (Form 6) will be issued by the Department of Building Inspection. Click here for the Demolition Debris Recovery Plan (DDRP) form.